Oscar-Worthy Meal, On A Shoestring! Odds are you'll be watching the Oscars from the comfort of your living room, so why not prepare a special Oscar dinner for the occasion? On The Early Show Saturday Edition, young Aaron Deal accepted the "Chef on a Shoestring" challenge of making an Oscar-themed, three-course meal on our meager, recession-busting budget of $35. Deal is all about using the freshest ingredients available; he's even gone so far as to ban most processed products from his kitchen! And his attention to quality hasn't gone unnoticed: He's quickly become the talk of Charleston. He also threw his chef's hat into The Early Show Saturday Edition's "How Low Can You Go" competition, seeing how the totals of our Chefs on a Shoestring stack up. The one with the lowest total gets to return to prep our blowout holiday meal at the end of the year. Among Deal's dishes Saturday: a variation of Chicken Oscar using spinach, ricotta and prosciutto ham. Traditional Chicken Oscar is made with asparagus and crab meat. And for dessert, he made his grandma's red velvet cake, in honor of the red carpet. 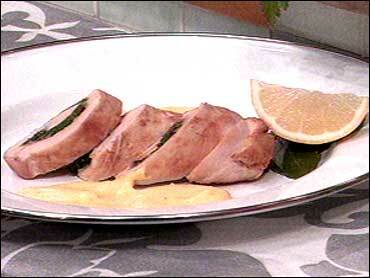 Oscar Chicken: The classic dish Veal Oscar is reputedly named for a Scandinavian king. This version uses chicken instead of veal, and Deal stuffs the chicken with prosciutto rather than crab meat. Prosciutto: Pronounced "pro-shoot-toe," it's the Italian word for ham. In English, the word is almost always used for an aged, dry-cured, spiced Italian ham that's usually sliced thin and served raw. Hollandaise sauce is an emulsion of butter and lemon juice using egg yolks as the emulsifying agent, usually seasoned with salt and a little black pepper or cayenne pepper. It's a French sauce, so-named because it was believed to have mimicked a Dutch sauce. Hollandaise sauce is well-known as a key ingredient in Eggs Benedict. Red velvet cake is a type of rich and sweet cake, with a distinctive, dark, red-to-bright red or red-brown color. It's most popular in the Southern United States, though known in other regions. The most typical frosting for a red velvet cake is a butter roux icing (also known as a cooked flour frosting). Cream cheese butter cream frostings are also popular. In a food processor add all ingredients except the oil. Process until smooth consistency. With processor on, in a slow steady stream add oil until fully incorporated. Store in air tight container under refrigeration. Using a bread knife, slice the baguette very thin on a strong bias. Rub the pieces with olive oil and season with salt and pepper. Place on a baking sheet and toast in oven until golden and crisp. While bread is toasting, use a vegetable peeler and shave the desired amount of cheese. Using a mixing bowl toss romaine leaves in a small amount of the dressing being sure to coat them well. Remove the bread from the oven and plate the salad immediately. Place a nonstick skillet over moderate heat. When skillet is hot, add butter, shallot, and garlic. Season with salt and pepper and saute 3 minutes. Add about a third of the fresh spinach to the pan and cook until wilted. Continue to add the remaining spinach and cook until wilted. Transfer spinach mixture to a kitchen towel, spreading mixture slightly over the towel. Let mixture cool for 5 minutes. Twist towel around spinach and wring it out until dry. Transfer to a medium-mixing bowl. Add grated parmesan and mix thoroughly. Set aside. Preheat oven to 350ºF. Place skillet back on medium heat. Next, arrange one slice of the Prosciutto on each chicken breast and mound a portion of stuffing on top. Wrap and roll breast over the stuffing. Secure breasts with toothpicks. Add 2 tablespoons of oil to the pan. Add chicken to the pan and brown on all sides. Once all chicken is browned, place on baking sheet or pan and place in oven to finish cooking, about 7 - 10 minutes. Place a double broiler on medium heat. Once water is simmering, place egg yolks and lemon juice in a metal mixing bowl. Whisk eggs over water slowly cooking them, being careful not to burn. Once egg yolk mixture has thickened slightly, remove from heat and set aside. Next, take butter and slowly whisk in a steady stream into the egg yolk mixture while whisking. Continue until all butter is incorporated. Next, whisk in hot water. Season with salt and hold warm until ready to serve. Cream together the butter and sugar. Add the eggs one at a time and blend well. Combine the dry ingredients and add gradually alternating with the milk. Blend well and add vanilla and red coloring. Pour onto greased and floured cake sheet pan. Bake at 300ºF for 30 minutes or until toothpick comes clean. Blend the butter and cream cheese together. Gradually add powdered sugar and small amounts of milk (or water) until all the sugar is added and is consistency desired. Stir in coconut. Frost the cake after it has cooled. (Using water limits the need to keep the cake refrigerated). So, how did Deal do in the "How Low Can You Go" fray?